Toast the cumin seeds in a dry skillet over medium-high heat until fragrant, about 2 minutes. Place the cumin seeds, garlic, chile pepper, salt, olive oil, orange juice, and lemon juice into the bowl of a blender; grind to a coarse paste. Toss the chicken with the marinade, then place into the refrigerator, and allow to marinate for about 2 1/2 hours. Heat a skillet over medium-high heat. Cook the chicken for 2 to 3 minutes on each side until browned. Place into the oven, and cook until the juices run clear, about 8 minutes. When the chicken is done, remove, cover with foil, and allow to rest for 3 to 5 minutes. While the chicken is in the oven, whisk together the olive oil, orange juice, lime zest, honey, and soy sauce in a skillet over medium-high heat. Simmer until the orange juice has reduced to 1/3 of original volume and is beginning to get thick and syrupy. Once thick, remove from heat, and whisk in the butter pieces one at a time until melted; set aside. To serve, place chicken on the plate and sprinkle with mango and avocado. Drizzle with the sauce, and garnish with cilantro and parsley. 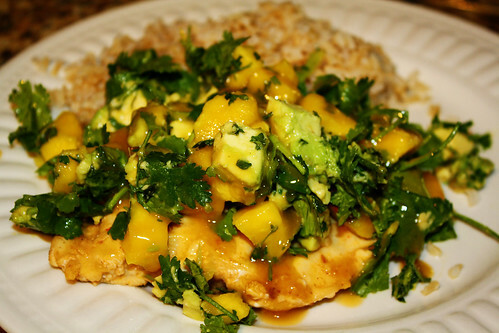 No comments for: "Spicy Cuban Mojo Chicken with Mango-Avocado Salsa Recipe"